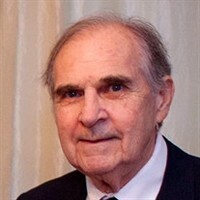 Jack Coder, 87, of Hampton, Illinois, well known Moline High School counselor, died Monday, March 26, 2018, in UnityPoint Health – Trinity Rock Island. Visitation is 4 to 7 p.m. Wednesday in the Horizon Room at Trimble Funeral Home at Trimble Pointe, 701 12th Street, Moline. Services are 1 p.m. Thursday at the funeral home with burial in Moline Memorial Park. Friends are invited to join the family at a funeral reception at CityView Celebrations at Trimble Pointe following the burial. Memorials may be made to the Hampton Historical Society. Jack was born July 8, 1930, in Moline, to Harold William and Gertrude Marie (Duncan) Coder. He graduated from United Township High School, East Moline, where he was president of the Senior Class, and from Augustana College in 1952, where he was on the football team. He was in the US Army for two years, serving in Korea, and married Beverly McNeal on December 26, 1954, in Hampton. He completed his master’s degree at the University of Iowa and was employed by Moline School District #40 as a guidance counselor at Moline High School for 38 years, retiring in 1991. He was a charter member of the Hampton Historical Society, and a member of Blackhawk Retired Teachers Association. He had a voracious curiosity, and enjoyed history and genealogy. and his wife Marcelle of Flagstaff, Arizona, Tad W. Coder of Hampton, and Ellie Coder and her husband Daniel Kosminsky of Rapids City, Illinois; seven grandchildren, Hannah Coder, Claire Coder, Katee Coder, Jack B. Coder, Merry Coder and her husband Dr. Kane Keller, Rebecca Kosminsky, and Christopher W. Kosminsky; a great-grandson, Maxwell Correa; a sister-in-law, Mary Jane Nelson of Hampton; and several nieces and nephews. He was preceded in death by siblings, Harold “Bill” Coder, Clifford Coder, and Bette Eggerichs. Jack’s family invites friends to share stories and condolences at TrimbleFuneralHomes.com. As everyone has expressed Mr. Coder was the best. We are all fortunate to have known him. Woodie and I were talking about stuff about three weeks ago and Jack’s name came up. Woodie had seen Jack his last trip to Moline. I asked for his cell number and called him out of the blue. We talked for about 45 minutes rambling across many topics that we encountered from the early days, the gap of 56 years, Gene’s passing on to current politics. He was interested in my geology career because a son is a geologist/anthropologist... for those who didn’t talked to him recently he was sharp and witty as every with that little bit of cutting humor. Mr. Coder was one of my favorite teachers both at John Deere for Civics and MHS for Economics. He was intelligent and humerus and his classes were always interesting. He was certainly one of the great teachers. I'm not sure they make teachers like that anymore. We had a lot of great teachers at MHS. I think we lived in the best times. I drove to Moline from my home in Arkansas to attend the visitation and service for our friend Jack Coder. I sent a floral piece from the Class of 1962, which was very prominently displayed next to his urn during the services. Jack had always said that our class was his favorite of all the classes that he had taught and counseled. He was the best, and we are all better people for having been exposed to him. I would appreciate it if we could send memorials to the Hampton Historical Society, % Beverly Coder, P.O. 275, Hampton, IL 61256. Now here was a teacher and counselor that made a difference in most of our lives and lead us to our right lifelong experiences. I can remember him telling me that that the colleges that I had chosen were going to be pretty tough and set your goals at a level that were more attainable. I knew he meant that graduation from them may not happen, but at the same time, he was pushing me to reach beyond my self-made dreams. I wanted to prove him wrong, and I eventually did. Graduated from Iowa State and he just laughed with me saying...my responsibility was to get you motivated and make something of yourself. I could see the pride in his smile just the same way my father's smile had come out. Will gladly give to the Hampton community. Add my name to the list of those who were influenced by Jack Coder. I always appreciated his direct manner and sense of humor. I was fortunate that I got to see Jack last fall and have a short chat with him. His body was failing him but his mind was razor sharp and his sense of humor intact. I wonder sometimes how the teachers, counselors and coaches would fare in today's world. I think Mr. Coder would do just fine. RIP. You will be missed by all who came in contact with you.